When moving towards a paperless office, there are a lot of potential complications that you need to address. These may be related to workflow processes, employee behaviours, or longstanding methods of how work is done in your office. In some cases, these habits may be hard to break. In other cases, the solution may be as simple as to provide a better option than the way people are currently doing things. 50% of office waste is paper. Often, these papers are printed as part of an antiquated workflow process. There are new digital solutions that can help reduce this unnecessary printing and paper waste, but first, we need to identify the problem areas and tackle the problem head-on. 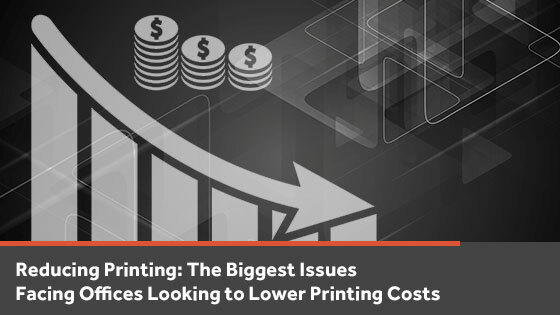 In this blog, we will identify some of the common issues that many businesses face when they are looking at reducing printing and the solutions you can use to overcome these obstacles for yourself. Accounts payable is one of the biggest culprits for paper waste in the office, and it’s rarely the fault of the people working in accounts payable. There are a number of internal and external factors that may make printing necessary for accounts payable staff. With accounts payable, records typically have to be kept for several years, meaning your office likely has a paper storage area filled with boxes of paper files. Just turning this manual storage process into a digital storage solution on your network can both reduce the number of pages your team is printing as well as make it easier for them to find and store documents. When possible, develop digital processes for approval of invoices and delivery of invoices. Use email to deliver invoices instead of printing and mailing to reduce printing and lower printing costs dramatically. Developing an internal process for the digital approval of invoices can further decrease the number of pages being printed. If signatures are required on invoices, set up a digital signing solution to facilitate this. Duplex printing is a setting available on every modern printer that directs the printer to print on both sides of a page; yet, many businesses still have single page printing set up on their printers by default. By setting the default property to duplex anyone who needs to print in simplex still can, but the typical user who doesn’t adjust the default settings is now consuming half as much paper. Overall, organizations see an average paper cost reduction of at least 15 percent from this one quick change! Since it is so easy to revert this setting for any one-time jobs that require simplex printing, there is rarely any resistance from end users. Making duplex printing the automatic setting is almost always the right choice for offices that are looking at reducing printing and lowering printing costs. Paper sales contracts are an old form of doing business that is still alive and well today even though there are now many digital options available that allow customers to agree to contracts without a single sheet of paper being printed. Try using apps or online services that allow customers to provide their digital signature. This can also save unnecessary trips for customers coming in to visit or sales staff travelling to collect signatures. If paper copies of contracts are still needed, then duplex printing (mentioned above) should be used. Efforts should also be made to consolidate sales contracts. For example, if your business requires multiple contracts for a customer that relates to each department, then those contracts should be combined into one simplified contract if possible. All of these methods mentioned not only serve to reduce printing in your office but also help improve the customer experience by making the sales process more streamlined, simple, and fast. Expense reports are often a hassle, which while necessary, aren’t enjoyed by employees, managers, or the environment. Typically paper expense reports are completed on a regular basis and, once approved, usually filed away or shredded, never to be seen again. Luckily, there are ways to reduce printing for expense reports and save on the cost associated with that printing. Switching to a digital expense report system is a great way to eliminate any printing required for expense approval. In some cases, employees can even submit digital receipts rather than paper copies, further saving on printing costs and reducing the issues that arise from lost receipts. If paper expense reports must be kept on-hand at your business, look at increasing expense report windows from weekly to bi-weekly or monthly. This simple change could equally reduce the time and paper consumed from expense reports by 50 percent or more. Unfortunately, the goal to eliminate printing does not happen overnight. There are countless tasks and process that could be assessed and changed, however, with the right solutions in place, reducing printing and lowering printing costs can be both straightforward and rewarding. Want a more in-depth read about printing cost reduction? 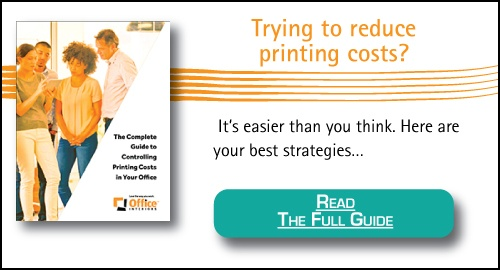 Download our ultimate guide to Controlling Printing Costs! 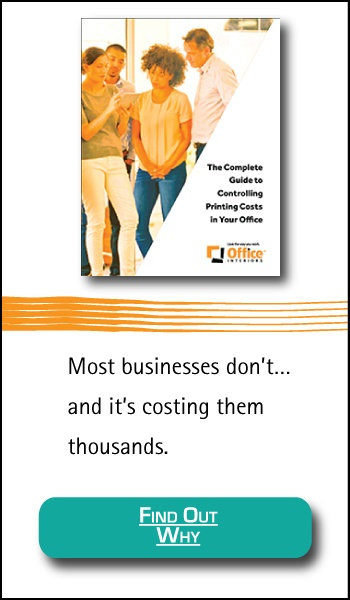 Do you know what your printing costs?